This is our final recap of every episode of Outlander this season, both in blog post AND podcast. Kendra and Sarah have been focusing mostly on the costumes — designed by Terry Dresbach — in our blog posts, but tackling both the costumes and the story itself in our podcasts. You can find the podcast at the bottom of this post, or on iTunes! This week, we have a special guest on the podcast: historian of Scottish costume Brenna Barks rejoins us for our finale podcast, which covers the second season in general. Brenna wrote our fabulous review of Outlander’s season 1 men’s costumes, and joined us for the podcast on episode 4 of season 2. 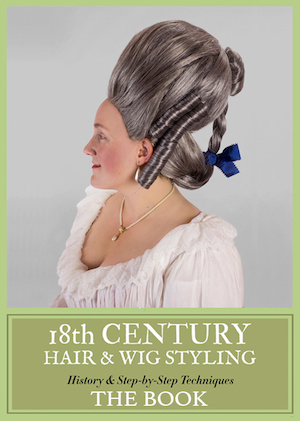 Brenna is a dress historian and material culturist who completed her MSc in History, Theory, and Display at the University of Edinburgh in 2010. She is the Managing Editor at Worn Through, has contributed to an encyclopaedia of American fashion history, and has published in Jane Austen Knits. Her current research interests focus on clothing and material culture and their social implications from circa 1740 onwards, particularly that of Scotland, India, and the British empire. She has also been known to moonlight on the topics of social and cultural history between 1910 and 1940, and on the clothing and culture of Japan — the latter having been the focus of her undergraduate studies. This episode jumps back and forth between 1968 and 1746 repeatedly, so bear with! We begin in 1968 with a bearded young man watching telly. It’s Roger Wakefield, and it’s his adopted father’s (the Reverend Wakefield) funeral. Turns out its Brianna, daughter of Claire and Frank Randall. Frank has died, and Claire and Brianna are in Scotland just for the day to pay their respects. Back in 1745, Jamie argues with Bonnie Prince Charlie, trying desperately to avoid the battle of Culloden on this day. Chuck is having none of it. In 1968, Roger takes Brianna sightseeing, including to Fort William, where Jamie was flogged, raped, and other bad things happened. Back in 1746, Claire suggests that they could poison BPC, since if he were dead the battle wouldn’t happen. Jamie is considering it. Brianna tells Roger that there’s a secret between her parents that relates to their time in Scotland, and she wants to find out what it is. Claire visits the local archivist, who finds a deed to Lallybroch that gives it to Ian (Jenny’s husband), and is signed with her name. Roger takes Brianna to the university at which his father worked, so they can look through his old papers and journals. Jamie and Dougal fight, and Jamie ends up killing Dougal with Claire’s help. Brianna and Roger find newspaper clippings about Claire’s disappearance, and grab the Reverend’s journals to take home to learn more. Rupert walks in post-Dougal killing and is not happy. Jamie bargains with him for 2 hours before he promises to return to face what he’s done. Claire finds the Clan Fraser stone at Culloden, and tells Jamie everything that’s happened to her since 1746. Brianna confronts Claire, who tells her (and Roger) everything. Brianna is SO not down and doesn’t believe her mother. Jamie writes a deed giving Lallybroch to Ian (and Jenny), which he backdates so that it will be from before he became a “traitor.” He tells Fergus to take the deed to Lallybroch, and Murtagh to put the Lallybroch men on the road home. Brianna and Roger have a drink. Claire tries to visit Gillian, but instead finds her husband, who she left a few weeks ago. The husband is not in good shape, although he is clearly rich because he has a stunning home and 2 luxury cars. Claire manages to sneak away with Gillian’s journals. Gillian shows up at the pub, and tells Brianna and Roger that she’s about to leave to go somewhere to further the cause. Murtagh agrees to get the Lallybroch men safe, but then wants to come back and die with Jamie. Claire goes through Gillian’s journals, which have all her research on time travel. Gillian thinks that she needs a human sacrifice to go through the stones. Claire, Roger, and Brianna figure out that Gillian is planning to go asap. Jamie leads Claire away from the camp. He wants her to go back to her own time to be safe, because he’s realized she’s pregnant. Jamie says he’s a dead man because of killing Dougal so he’d rather die in the battle. Claire tries to get him to agree to an alternate plan, including possibly coming with her through the stones, but Jamie refuses. Claire, Brianna, and Roger turn up at Craigh na Dun. Where Gillian has torched her husband, found some oldey timey clothes, and goes through the stones before Claire can really talk to her. Claire and Jamie have a tearful parting, including a quick shag on the dirt. Claire goes through the stones. Roger tells Claire that Jamie didn’t die at Culloden. Claire realizes that this means that Jamie may still be alive. Listen to our podcast recap of episodes 12 and 13 (okay, really all of season 2) here or on iTunes! This episode was packed with information and nifty 1960s stuff. Really enjoyed seeing Geillis again. I want her sweater. I want Claire’s plaid skirt and Burberry. Nice touch of aging with the single Grey streak. Very Dana Winter. Fergus is in Season 3, but as an adult. Don’t know if there will be flashbacks with Ronann. Gosh he’s adorable. Need to listen to podcast bf I make more comments. We will see Romann as Fergus in season three because of what takes place at the beginning of book three. That building looks like Sterling University because it IS Sterling University! They don’t generally film anything around Inverness, staying as close to their studios just outside of Glasgow as they can. The deed of Sassine given Lallybrach to young Ian, Jenny & Ian’s son, with his parents as trustee until he comes of age. The deed of Sassine was given to young Jamie, Ian and Jenny’s oldest son. The little boy we see when Jamie and Claire go to Lallybroch in season 1. Yup! Young Jamie. I have young Ian on my mind as I’m reading Voyager!! Cold knees? Really? I wear skirts in winter all the time (I categorically don’t wear pants). That’s what the tights are for. It’s fine! And yes, I’ve done it in Scotland in snow too! Ovary up, Kendra! Oh I do it too, with leggings! But stockings (hose) just don’t seem warm enough to me compared to tights or leggings. If I recall correctly, the stockings(hose) in the 60’s were much thicker in feel than the stockings we wear today. Or am I just thinking about tights? I frequently saw young Scottish women sitting on literally frozen sidewalk pavements wearing tiny mini skirts and nylons. Admittedly they all looked like they’d had quite a few pints (each) and this was after last calls, but still FROZEN GROUND in pantyhose and mini skirts! The stockings then were, if anything, somewhat more sheer than pantyhose today. But there were different deniers so it would just depend. And also, then as now, it’s all to often beauty before comfort! I do know that having worn both stockings with garters and pantyhose I much, MUCH prefer stockings with garters. I was disappointed in the casting of Brianna. Too short and her acting was distractingly wooden. Roger’s hair could have been darker too. Nit picks, haha! Otherwise, really looking forward to season 3. 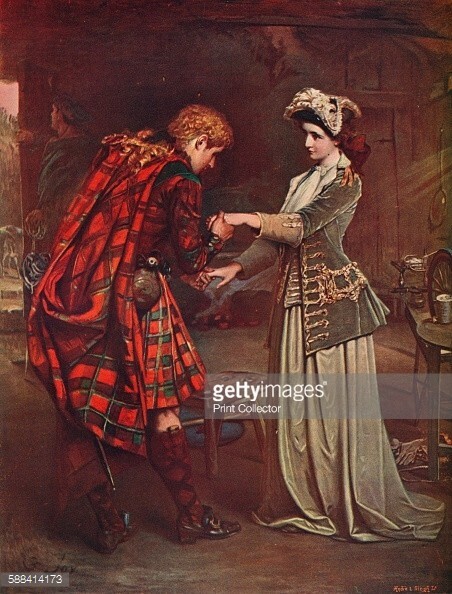 I found Brenna’s discussions about clan tartan and the show’s depiction of BPC VS historical record very interesting! My knowledge of these things is very spotty. Brianna’s height definitely bugged me, and I think Sarah may have been right about the accent issue! Glad you enjoyed the podcast! Thank you, Robyn! It was my pleasure (where else can I wax rhapsodic about my research topics?). I’m glad you enjoyed it as much as I did. Glad you guys liked it. I wish I had ways to post pics of the Queen tromping around Balmoral in hose, from the 40s to know. I could also post a pic of John Lennon or Bob Dylan wearing the same kind of Greek Fishermans cap as Brianna, back in the 60s. Heh, I love the hat! Both as a ’60s throwback & as a modern thing (I have one still). Oh I know it was totally how it was done! I just don’t think it would be very comfy! And yes, Brianna’s hat was very appropriate to the 1960s, I just can’t help but see it through a modern lens. Its funny to think now, but my mum, in early 70s Scotland (so not much later) didn’t own socks and had to borrow my dad’s to wear under boots if it snowed (still with skirt and 20 or 30 denier tights of course). Jamie was flogged at Ft William but all the other stuff happened at Wentworth. The outfit Geillis goes through the stones is the dress she was wearing when she first met Claire. BPC isn’t portrayed that way in the books. They will be back at Lallybroch for a short time. I’m OK with the Rodger and Brianna casting. Sometimes you just can’t find an exact match to the books. I think they all work well together and that’s important. It’s an adaptation of the books so there are going to be changes. Loved the 60’s clothes! I had a pair of the corduroy bell bottoms in green. And of course the pea coat. I used mine for Halloween one year when I was a teenager. With a sailor hat, I did the trick or treat thing. (Free candy)! Just wanted to say thank you for this! Such a pleasure to be able to study the costumes more closely. Sadly no more kilts next season. They were banned by the British after Culloden. Damn. I take it you haven’t read the books. I am half way through Voyager. But they will spend the first few episode focusing on the 20 years they were apart (that’s what i read). So more kilts? I hope? Yes there should be more kilts. And book 3, Voyager ends with them in South Carolina in the islands off the coast, I believe. And ….7) Claire and Jamie shagging. Yay, Sarah and Kendra will be pleased. Followed by *types with tongue firmly in her cheek* more shagging, shiny clothes, still more shagging, and Wee Fergus. Have you ever noticed that every redcoat soldier in every historical television show made in Great Britain has primrose facings. I always figured that Angel’s has a rack of fifty scarlet coats (wrong shade of red, by the way) that are re-used again and again (in every series of Sharpe, among others). These mid-18th Century coats with their wider lapels don’t look like the same old coats with wider lapels, though. Primrose yellow was a reasonably common colour in British Army facings during the 18th and 19th Centuries, but it does get to be a bit much. You’re right that the ’45 was before there were clan tartans, and distric tartans aren’t the same thing, so stick to your guns. We shouldn’t expect a 1745 Stuart to wear the tartan that the Sobieski-Stuarts invented for them. Also, in a universe with time travel through standing-stones the New Look started early. Also, remember the canary Dior-style bar suit and hat that the Marquise de Mertuil wore in Dangerous Liaisons? Same time travel thing. That’s interesting about the yellow facings, and I wonder how far back it goes, if everyone’s been using the South Essex uniforms from the Sharpe films since the 90’s. I know they were made for those productions, and then reused for the 2005 Pride and Prejudice for the militia, so they’ve probably been passed down since then . I LOVE Brianna’s green coat, I have to get something like that for autumn/winter! I remember knitting those Aran jumpers.